Jaal is a possible partner for the female Ryder sibling Sara. 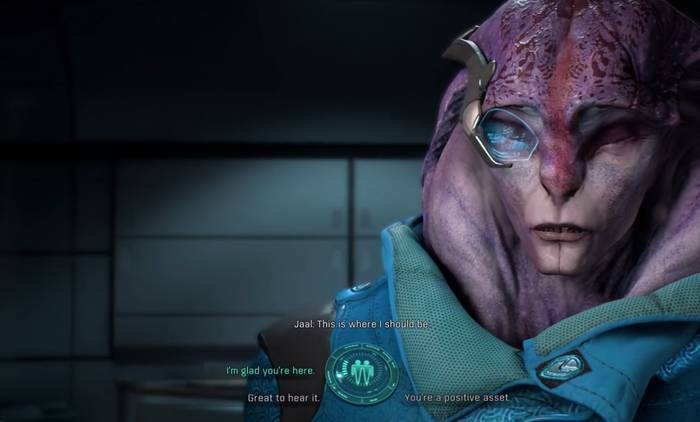 While he might not show any interest at first, Jaal will eventually open up and reveal a sweet and romantic side once you try to get close to him. Following the Main Mission A Trail of Hope, talk to Jaal on the Tempest when he finally comes aboard and joins the Pathfinder team. He won’t have any romantic dialogue options early on. Most of the choices you have will just lead to him giving you access to his Loyalty Missions. Talk to Jaal after returning from Voeld. From the dialogue options, tell him that you’re interested in him and like him being around. This will allow you to access his Loyalty Mission Friend or Foe, which is part of the strategy to advance his relationship level with you. When the vidcon plays at the meeting room, you can have the option to tel Jaal that Akksul is just “jealous of him” to advance your relationship level with him. Jaal will email you after you’ve completed the Main Mission Hunting the Archon, telling you that he wants to talk about something. Talk to him in his quarters to begin the Loyalty Mission Flesh and Blood. From there, proceed to Havarl and meet up with Jaal’s contact. 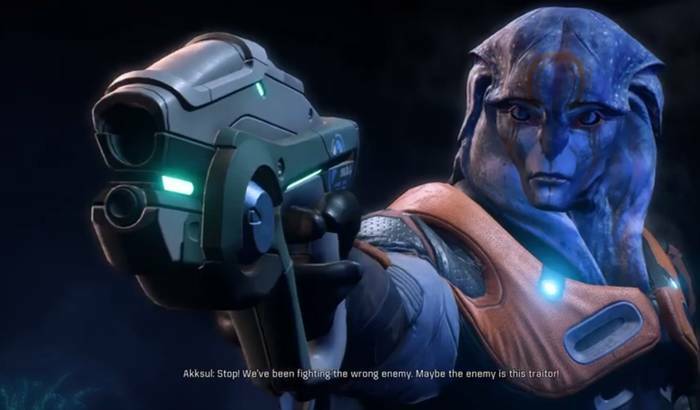 During the climactic custscene of Flesh and Blood, Akksul will be pointing a gun at Jaal, and you pointing at Akksul. Do not shoot Akksul. He will miss Jaal, prompting his followers to conclude that he is evil. You will earn Jaal’s trust and respect from here on. Head back to the Tempest and you’ll receive an email from Jaal. He wants you to meet his family. Head for the location and give his mother a hug when the opportunity comes. After this, Jaal will invite you back in his room and you’ll exchange affirmations that you love each other. This will put you into a committed relationship with him and you won’t be able to romance any other characters from here on. Head to the location on Aya and meet Jaal. You can choose to kiss him as you walk toward the waterfall. This concludes the romance line for Jaal.